Here at Family Food LLC we offer lots of tips and advice to make eating healthy easy and enjoyable for yourself and your family. But let’s get real for a second: loading our carts up with the healthy stuff can get expensive, especially if you have a lot of mouths to feed. Lean meats and produce sure can run up the grocery bill more than frozen chicken patties and boxed mac and cheese. We get it, times are tough, but a healthy eating plan for your family is worth every penny. What we can offer you is some of the Academy of Nutrition and Dietetics’ tried and true tricks for keeping your nutrition up and your spending down. 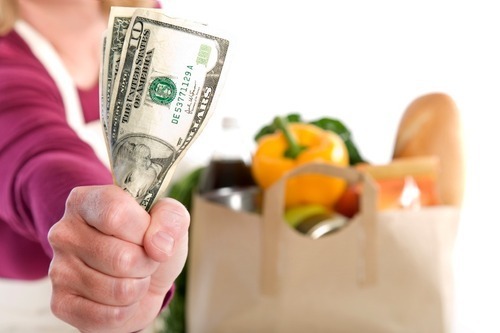 Here are ten tips to help you stretch your food dollar, and keep it healthy. 1. Plan menus and make a list – Think wandering aimlessly through the aisles throwing random food in your cart will keep you from a financial meltdown in the check-out line? Not so. Instead, try setting aside some time each Sunday to plan your meals for the week and make a grocery list based off of those meals. Your grocery store’s website might be able to help with this, as many offer meal planning and pricing tools. Bonus: Incorporate some of the same ingredients into multiple meals. Doing so will make your purchases go even further and prevent you from wasting food. 2. Use coupons and rewards cards – In addition to making a grocery game plan on Sunday, you should also check your newspaper inserts for coupons. They often contain anywhere from $50 to $75 worth of savings. Another place worth looking is online at websites such as www.coupons.com; many brand websites also offer manufacturer’s coupons for their products as well. One caveat we have about coupons, though, is not to buy something just because you have a coupon for it. Make sure you are using coupons for things you already purchase, otherwise you’re just buying items you don’t really need and wasting money. In addition, rewards cards are a free and easy way to ensure that you get all of the in-store sales. Just attach the card to your keyring and scan it at check-out! 3. Buy store brands – We have trouble with this one ourselves, since we have preferences when it comes to our beloved cereal and Greek yogurt. But store brands are often 15 to 20 percent cheaper than their name brand counterparts, while the quality of the products may be equal. We always encourage buying the store brand for generic items such as flour, sugar, milk, and bread, saving your name brand purchases for the items where you can actually detect a difference in quality. 4. Buy on sale and in bulk – This piece of advice really comes in handy for those of us with growing families. If you don’t already have a Costco, Sam’s Club, or BJ’s card – get one! These stores often charge a yearly membership fee, but trust us, it will pay for itself! Buying in bulk is a great way to save money on items that are shelf stable such as grains, dried beans, cereals, and nut butters. Be sure to only buy large quantities of things that your family gobbles quickly, since these items can take up alot of space and some may spoil before you get a chance to use them. 5. Compare unit prices – Use the unit price (price per pound, ounce or pint) to compare name brands to store and generic brands or bulk and economy sizes to single-serve and regular sized packages. Most stores display the unit price on the shelf tag. Looking at the unit price is a fool-proof way to tell whether or not buying a larger quantity of something is actually worth it. 6. Read food labels – Compare ingredients and nutrients using the % daily value. Aim to purchase more nutrient-dense, less processed foods by keeping the saturated fat, trans fat, cholesterol, and sodium low, the ingredient list as short as possible, and increasing the fiber, vitamins, and minerals. 7. Shop the perimeter – Fresh produce, meats, dairy, and breads tend to be on the outskirts of the grocery store, so start there before hitting the middle aisles for other necessities. These foods can be affordable if you shop smart, and are definitely healthier and cheaper than some of the more processed food found in the center of the store. 8. Shop seasonally and locally – You can save a bundle on fresh produce when it is in season and has less distance to travel. Make a Saturday trip to your local farmers’ market a fun outdoor family activity or join a produce club to take advantage of seasonal fruits and veggies. This offers a great opportunity to educate your family about fruits and vegetables and get them involved in selecting and preparing them. 9. Keep foods safe and prevent waste – Use dating information such as “sell by” and “best used by” to help you in selecting the freshest foods at the market. Try to put cold and frozen foods in your shopping cart last, and store them in your refrigerator or freezer as soon as you arrive home. Arrange foods so that the ones with the oldest “sell by” dates are used first. 10. Pay attention at the check-out – Make sure that prices ring up as indicated or advertised, especially sale items. Some stores will even give you the item for free if they make a mistake on the price. If you have a decent amount of coupons, watch as each one is scanned to be sure that the discount is taken off of your bill. While we aren’t able to reduce your grocery spending to nothing, we hope that these helpful hints have given you the tools you need to get the healthiest and best buys possible, whether you’re shopping for two people, or ten! Head on over to the Academy of Nutrition and Dietetics website at www.eatright.orgfor more shopping advice and healthy recipes. Don’t forget: Your insurance plan could qualify you for SIX FREE VISITS with our registered dietitians, so visit our Services page for more information! As always, feel free to contact us by phone or e-mail with all of your nutrition concerns, or leave us a message on Facebook or Twitter! June is Dairy Month. All cow’s milk, like human milk, inherently contains growth hormones. Among the most publicized is bovine growth hormone (BGH), or bovine somatotropin (BST) – a hormone that cows naturally produce. The synthetic form, rBGH or rBST, is given to cows to extend the lactation period by increasing levels of another hormone, insulin-like growth factor (IGF-1), ultimately increasing milk production with less feed, less animal waste and less methane production. 5 Things Your Parents Got Wrong About Food – And How to Fix Them! It’s Party Time: Fresh Ideas for Your Next Gathering!